The head of an Indian rights organization in New Mexico recently suggested that the Navajo, Apache and other tribes in Arizona and New Mexico are eating too much fry bread. Suzan Shown Harjo, president and executive director of The Morningstar Institute, wrote in Indian Country that the fattening fry bread loved by the Native Americans in the Southwest is unhealthy and consequently a prime contributor to the growing obesity and diabetes epidemics among the Indians. She criticized the puffy, fried dough disks prepared in heated animal fat and sold across the country at powwows, fairs and Indian rodeos and urged the people to stop eating the stuff as the first step toward regaining good health. Harjo also urged the people to give up their love for junk foods, especially greasy potato chips and sugary soft drinks. 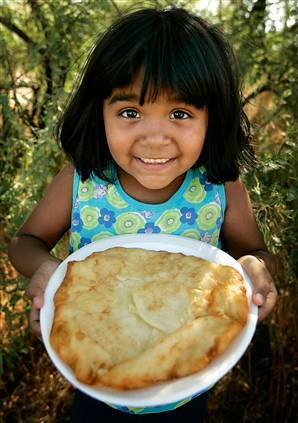 But if there is anything really tasty sold by the Indians at public reservation gatherings, it is fry bread. You see it everywhere. It is cheap. Easy to make. And a real treat to eat. Strangely, the Indians invented this delicacy out of necessity after they were rounded up and forced to live in government concentration camps in the mid-1800s. At the end of the Long Walk, a forced march in 1863 that relocated Navajos and Apaches to Army camps along the banks of the Pecos River at New Mexico’s Fort Sumner, the Indians were given rations of white flour, salt and animal fat. Gone were the traditional native foods like elk, buffalo, corn, beans and squash. The women of the tribes did the best they could with the rations, Harjo says. They formed dough balls that were patted flat and then cooked in boiling animal fat over fires. For a time, it was a main staple in the Indian diet. Unfortunately, fry bread became popular. And it tastes very good. Having once lived among both the Navajo and Apache Indians, this writer has to agree with Harjo that fry bread is one sneaky junk food that you can quickly learn to love. My wife, Doris, and I got our first taste of fry bread on about our first day after moving in with a Navajo family near the Four Corners. We found the couple living a frugal life style. There had been a flash fire in the kitchen from a defective electric cook stove. For lack of money they were preparing meals out of doors, on a simple grill over an open flame. Thus our first meal involved slabs of beef (we weren’t vegetarians in those days) and fry bread cooked over the hot embers of burnt juniper. We watched the woman prepare the dough for the fry bread in a large oval pan. It was made from plain white flour, some salt, other seasonings and water. She mixed this, kneaded it briefly, then laid flattened dough over the fire. Because it was patted very flat, the dough browned in seconds. It was then flipped over, browned on the other side, then served warm. My first thought was that simple dough and water could never be something I might like to eat. But I was surprised. It had a sweet robust flavor that made you return for more. The fry bread was to the Navajo what bakery bread is to the Frenchman. It is usually served at every meal. And it is true that richer, sweeter and deep fried varieties of fry bread are served at public gatherings from street venders that taste like many other American pastries. I have no doubt that Harjo is quite right in denouncing the delicacy as one of the reasons the Navajo, the Apache and many of the other Indians of the Southwest are getting very fat. They have very little work, they have lost their identity, and they spend their days eating junk food and their nights consuming alcohol. It was a rich culture lost in the heart of America because of the cold heartedness of an invading Christian oriented European people who shut their minds and hearts to all that the real natives of America had to offer.